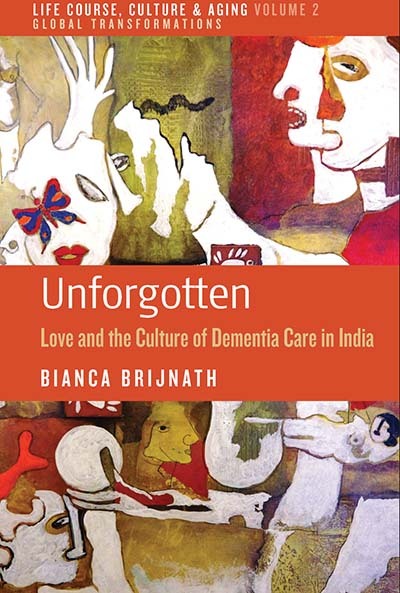 Bianca Brijnath’s book, Unforgotten: Love and the Culture of Dementia Care in India, offers a long-awaited, fresh insight into the lives and experiences of people with dementia and their caregivers in middle-class, middle-aged, educated Delhi-based families. Using the lens of critical and sensory anthropology, this ethnography is an invaluable contribution to previous monographs on aging in India, for which Lawrence Cohen (1998) and Sarah Lamb (2000, 2009) are perhaps best known. Brijnath notes that the complexity of dementia is increased by globalization, migration, consumerism, urbanization and the changing role of women. In just over a decade, the understanding of dementia in India has shifted towards a phenomenon that is “rooted in technology, class and age, rather than the perils of modernity and ‘bad’ families” (Brijnath 2014, 8). Modernity, often understood as the adoption of supposedly ‘Western lifestyles’, is no longer seen as just a danger to the family hierarchies and the venerated role of the elderly in the society, but it can also provide an alternate framework of explaining the relationship between age and dementia. For example, while dementia was described in terms of senility and madness in the past (Cohen 1998), Brijnath’s informants talked about dementia using the metaphor of computer software gone awry, and they were well aware of biomedical definitions and technologies used in care for people with dementia. A chapter on methods sincerely describes the uneasiness of the researcher who tries to position herself in the field, while trying to accept that she can give little back to her informants as she is not a medical doctor herself. Furthermore, Brijnath discusses how she hoped for a neat research situation that would enable her to follow protocols regarding confidentiality and informed consent, imposed by the academic institution. But this failed in more than one way: to Brijnath’s frustration, the interviews were often interrupted, as informants invited friends, extended family members and colleagues to take part in this special occasion; the protocols “to minimize interview distress” (Brijnath 2014, 30) of people with dementia were ineffective; and the people were highly averse to sign any informed consent. Despite (or perhaps through?) these troubles, Brijnath managed to build intimacy, if not friendships, with her informants, and the reader can feel the depth of these connections in the stories revealed throughout the rest of the book. Chapters two and three describe the experiences of families in diagnosing dementia and then seeking treatment for the afflicted person. Using the approach of sensory anthropology, Brijnath analyzes the diagnostic process through three kinds of ‘seeing’. The family first ‘saw’ that something was going wrong and they had to differentiate the medical pathology of dementia from the cultural category of senility as described by Cohen (1998). Then they had ‘to show’ the person suffering from dementia to the doctor in a hospital where various technologies for scanning (and thus ‘showing’) brain activity were used. Families often had difficulties accepting that there was no cure, only long-term caring, for the person with dementia. So in order ‘to be seen’ by the public as a caring family, they tried to look for cure, or ilāj, elsewhere. The search for a cure and for a ‘good’ doctor were expressed in doctor shopping, and families would journey from one kind of healing system (biomedicine) to another (traditional and transcendental medicine), as well as from India to faraway countries and back again. Not surprisingly, such engagements entailed significant costs, in terms of physical objects such as drugs and diapers but also subjectivities such as feelings of sadness, guilt and duty. Brijnath devotes the fourth chapter to the analysis of the financial aspects of dementia care. Costs come together with the concept of exchange and exploitation in the practice of hiring attendants and servants. The economic and social disparity between the family and the attendant is intertwined with the notions of class and caste. These, in turn, are closely linked to the identity of a family as a unit and of its individual members. For example, the boundaries of family became blurred when the attendants started claiming kinship as daughters and nieces, a practice which helped female attendants to overcome gender barriers when caring for males. Brijnath again turns to sensory anthropology in the chapter on dementia and “the Indian appetite” (Brijnath 2014, 116). In India, food and the appetite are considered central aspects of care and relating: they are not only important as sustenance, but are the “material representation of identity in age and gender as well as a currency of personhood in social exchanges” (Brijnath 2014, 135). What to feed a person with dementia, when and how are all techniques with which caregivers can manage and survey themselves and the people they care for, Brijnath suggests. Moreover, in this and the final two chapters, one on stigma and loneliness in care and the other on death, the aspect of love comes forth as an integral part of caring. Discussing the emotion of deep love in India is not something that one comes across frequently in academic literature (but see Trawick 1990). My own informants in the South Indian state of Kerala pointed out that in Indian families talk of love is very rare; rather than expressing it verbally, they show love through caring practices, they told me. Similarly, Brijnath’s informants, especially males, avoided answering her direct questions on love. But one male caregiver’s loving feelings become apparent in his account of waking up in the middle of the night to feed ice-cream, a sweet food that is especially ‘appropriate’ for an ageing body (see Lamb 2000), to his afflicted wife. As Brijnath writes (2014, 182), “(l)ove was in the sweetness of sugar, in the longing for home, partnerships forged and efforts to retain identity.” Love is thus only alluded to, implicit in care-giving process and influencing relations, power plays and the seeking of better treatments and even cures. Even more, Brijnath’s informants related old age and care as a “time for romance” (Brijnath 2014, 183), a time that is especially savored because the caregivers become sharply aware of the limited amount of time they have with the person with dementia. In anthropology, death tends to be a subject of interest when it is accompanied by rituals; in public health, death is discussed through numbers. On the final pages of her book, Brijnath eschews both these aspects and dives into the nitty-gritty of care at the end of life: the boredom and repetitiveness of the every day; the pain, in every sense, of degeneration as the people with dementia forget how to walk, talk and swallow; the reality of cleaning up when the person with dementia starts forgetting to go to the toilet; and even the difficulties of donating their organs when persons with dementia pass away. These are not easy details to address, for Brijnath’s informants, for the researcher herself, nor for the reader. It is therefore understandable that as the book is coming to its end, various artistic features move in. Metaphors of cooking, which first appear in the fifth chapter, become complemented by wordplay (e.g. “Bride and Prejudice”, Brijnath 2014, 167) and poems. The whole final chapter is written in the form of a theatre play, with acts, scenes and intermissions—a stylistic turn that the reader would not expect while turning the first pages of the book. Unforgotten will certainly be of interest to medical and other anthropologists. A meticulous anthropologist will perhaps miss a more in-depth discussion of the meaning of the word ‘culture’, which appears in the title, but it remains unclear to what exactly it refers. The book should also attract the attention of anyone working with the elderly, in India and elsewhere, providing private or public health services. Besides contributing to academic research, Brijnath’s study is linked to a very practical, tangible urgency: in-depth and up-to-date understanding of dementia and people who are afflicted by this illness is crucial for Indian families, as well as for the formal health care systems in order to prepare for the future, as a 346 percent increase in dementia prevalence is projected to occur by 2040 (Brijnath 2014, 2-3). With this work, Brijnath proves that ethnography can be both science and art, and can at the same time transcend the walls of academia to serve more practical causes. A rare combination that is a step forward for academia, and for humanity. Cohen, L. (1998). No Aging in India: Alzheimer’s, The Bad Family, and Other Modern Things. Berkeley: University of California Press. Lamb, S. (2000). White Saris and Sweet Mangoes: Aging, Gender, and Body in North India. Berkeley: University of California Press. Lamb, S. (2009). Aging and the Indian Diaspora: Cosmopolitan Families in India and Abroad. Bloomington: Indiana University Press. Trawick, M. (1990). Notes on Love in a Tamil Family. Berkeley: University of California Press. Tanja Ahlin is a doctoral candidate at the University of Amsterdam, working in the fields of medical anthropology and science and technology studies. In her research project, she explores the influence of everyday information and communication technologies on elderly care in Indian transnational families. Ahlin T. Bianca Brijnath’s “Unforgotten: Love and the Culture of Dementia Care in India”. Somatosphere. 2015. Available at: http://somatosphere.net/2015/bianca-brijnaths-unforgotten-love-and-the-culture-of-dementia-care-in-india.html/. Accessed April 20, 2019. Ahlin, Tanja. 2015. Bianca Brijnath’s “Unforgotten: Love and the Culture of Dementia Care in India”. Somatosphere. http://somatosphere.net/2015/bianca-brijnaths-unforgotten-love-and-the-culture-of-dementia-care-in-india.html/ (accessed April 20, 2019).